It’s a new year, but the statistics are the same. The same things that made us sick in December will make us sick in January. Heart disease is still a problem, and there are so many things people have been told that are just plain wrong, that we wanted to take some time and educate you. This article is NOT brought to you by Merck, Pfizer or Bayer. With the new year upon us it is time for many of us to visit our primary care physician for that yearly physical. Whether it be for our employer or insurance, there’s a high percentage of us that will be will be making that appointment soon. At that time the doctor will almost certainly recommend running a basic lipid panel to determine your cholesterol level and risk of heart disease. Most of us have been conditioned to believe everything our MDs tell us- even if it’s completely wrong. But let’s think about this… do you know that doctors can lose their license if they don’t prescribe these drugs? Do you know that they actually have a quota that they need to maintain? And you haven’t lived until you’ve seen the smorgasbord pharmaceutical companies bring to medical clinics in an effort to make friends and customers. Without putting too fine a point on it, let me put it this way: if your PCP wasn’t at your last birthday party, they’re probably not going to jeopardize their license for you. WHAT IS CHOLESTEROL, AND WHY DO WE NEED IT? What they don’t tell you is that cholesterol plays an important role in your body’s function. It is the main component of cell membranes; it is a precursor for all steroid hormones; cholesterol is a precursor for Vitamin D production in our skin; it supplies nerve function and memory formation, and it is converted to bile salts, which help us break down fats. Without cholesterol, we would die. Low cholesterol means you are sick, and has been linked to shortening life span. Clearly our body needs a certain level of cholesterol, and having too little can have negative effects. SO, WHAT DOES THE LIPID PANEL REVEAL? Determining your “Total Cholesterol” is a simple equation: You add your LDL, your HDL and 1/5 of your triglycerides, and the sum is your total cholesterol. Makes sense, right? Except that it doesn’t make sense. The information in this equation is clinically inaccurate and… pretty much useless. The only truly clinically relevant marker are your triglycerides. LDL and HDL are, as their name suggests, lipo-proteins, not cholesterol. They are the carriers of cholesterol, but their levels have no significance to actual cholesterol levels. Using LDL and HDL levels to measure cholesterol is like trying to measure how many people are out on a Friday night by counting the number of cars on the street. An SUV could have one person in it or it could have ten- and that can be a big difference. And the math they use makes common core look rational. True story from one of our doctors: One of his patients had his lipid panel run by his regular doctor. His HDL was 60, which is perfectly acceptable. His LDL was 120. The “safe zone” is 40-130, so that was good too. Triglycerides were 100, so they divide it by 5 and end up at 20, another perfectly fine number. Add them together and we get 200. Apparently 200 was too high a number. They wanted to put this man, whose numbers were all in the safe zone, on a statin drug. Forget, for the moment, that statin drugs don’t decrease the risk of heart disease, and often elevate the levels they claim to lower; we’re talking about chemically altering someone who doesn’t need to be altered. His individual numbers are well within a good range, and looking at them collectively doesn’t change anything. Most conversations with a PCP regarding heart disease follow one of two paradigms. Doctor: Do you have high cholesterol? Doctor: Let’s get you set up on a statin drug. Doctor: Does anybody in your family have high cholesterol? Doctor: Let’s get you set up on a statin drug, just in case. What’s behind the huge push to get people on statin drugs? Why did the drug companies try to manufacture a chewable statin drug for children (fortunately the FDA put the kibosh on that!)? Why have there been movements to put statin drugs in our water? What’s behind the desire to get every single person in the country taking statin drugs? Even though your doctor might have your best health interests in mind, it doesn’t matter if your body doesn’t need a drug. Unfortunately, this is the standard of care in the medical community. If the number lands in a certain “Chicken Little” range, they’re going to put you on the drugs. The proof is self-evident: statin drugs are the biggest selling drug on the planet, and nobody wants to take on that cartel. 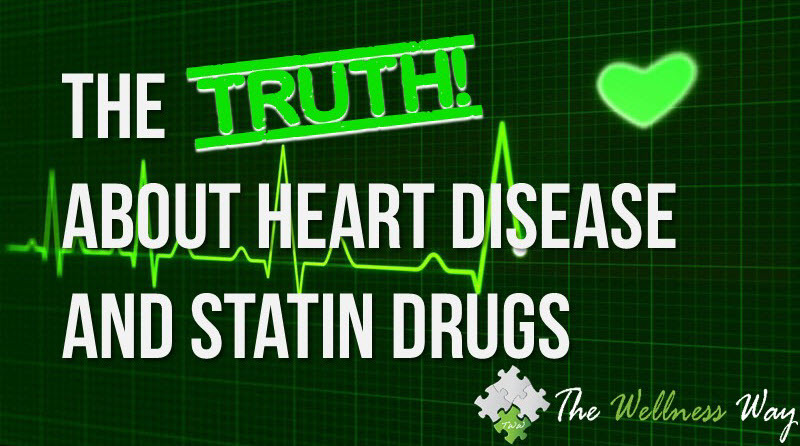 Arm yourself with knowledge, and be ready to tell your doctor that you don’t need statin drugs. If they wants to fire you (drop you as a patient), tell him/her you can live with that. If you have a family history of heart disease, if a doctor told you that your cholesterol is high, or if you’re on a statin drug already, our doctors recommend you make an appointment at a Wellness Way clinic and have the Advanced Cardiovascular Test run, along with an advanced cholesterol profile. They are both simple blood tests that measures the inflammatory factors in your body and the actual amount of cholesterol; how many particles and how big they are. Dr. Gregory Abbott, “The Heart Throb,” and a Wellness Way expert on cardiovascular issues recommends that every adult have that Advanced Cardiovascular Test done.